Proving I can live for under 500 Dollars per month in Tropical Paradise locations all over the planet. Here is a video explaining my Hotel in Rio Dulce, Guatemala. I work on the internet; therefore, I pay an additional 50-100 Dollars per month as a business related cost for 24/7 Internet access. 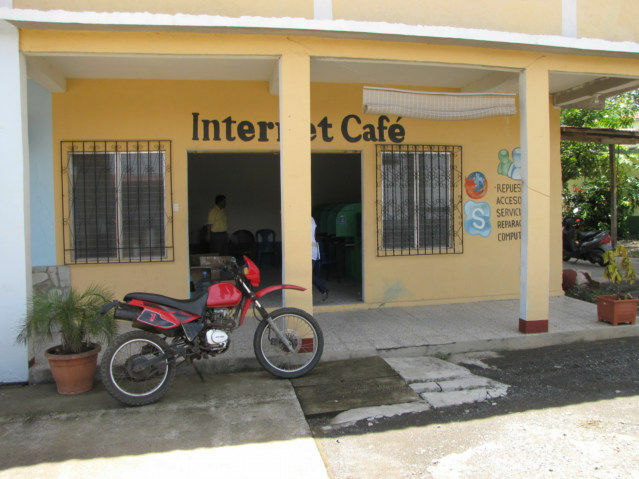 I can easily get a room here for 125-150 Dollars per month without the Internet access. Andy Graham, a.k.a Me in front of the Swimming Pool at the Hotel La Fonda Escondida where I have lived for the last month for 249 dollars. Note, an apartment is usually cheaper than a hotel; a hotel is competing with tourist, while an apartment needs to stay at local pricing, therefore can be much cheaper. 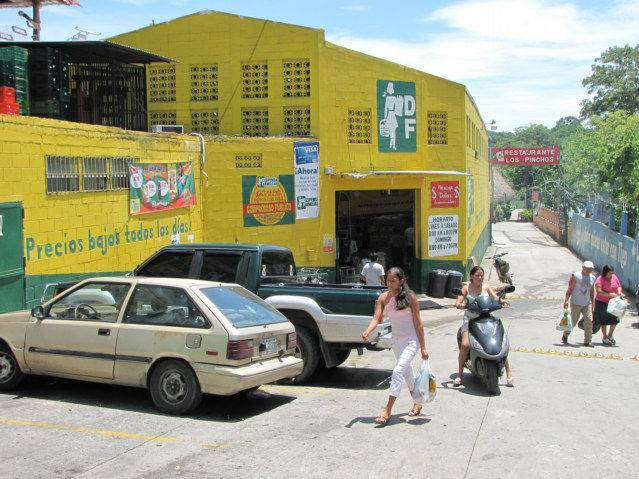 This is the Despensa Grocery, owned by Walmart here on the Rio Dulce River in Guatemala. The back of this grocery is on the river and boats, drive up to the back, and park. I always make my travelers nest close to a super market, life is cheaper. ATM machine, I have not used Traveler Checks in 12 years of travel, the word has ATM machines, even in Africa. Contrary to any mythical, misinformed opinions, there is always medical assistance and Doctors close. 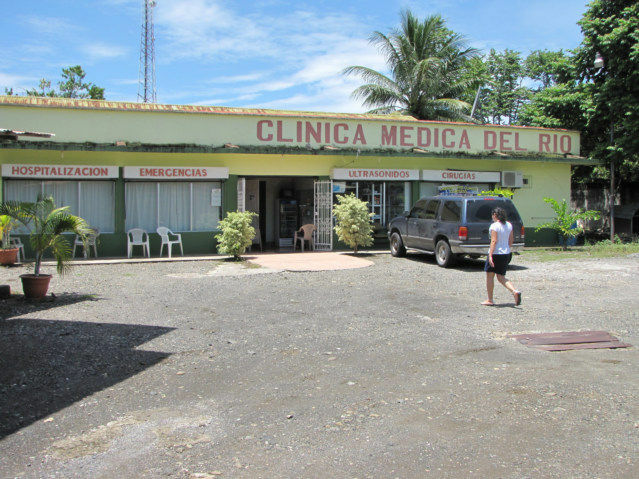 Yes, I admit, if I wanted to get better treatment for something special, I would go four hours by bus to Guatemala City, but most medical problems are simple. Mario the owner of this Internet Café behind the BanRural Bank helped me buy a new cord for my Laptop Computer. Mario speaks perfect English and truly a good person to help with Computer problems. 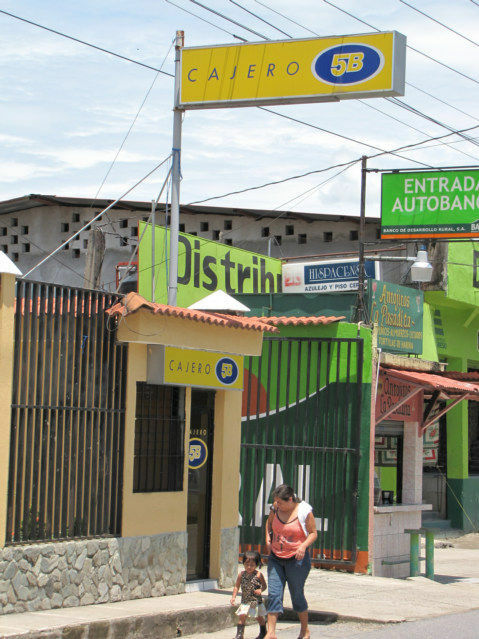 If you want knowledge here in Rio Dulce, I recommend you talk with Jody at the small convenience store in front of Brunos, however I do not recommend you stay a Brunos, for tourist, I suppose Tijax is best, but sort of in a swamp to live, but for tourist we can call it a Jungle…. View from the bridge that goes over the Rio Dulce (River Sweet). Note, anywhere near that bridge is a horribly noisy location for a month. If you want super cheap, try the Sindy Hotel next to La Fonda Escondida or other hotels in the center of the city. The super nice apartments for cheap, would be towards San Felipe. 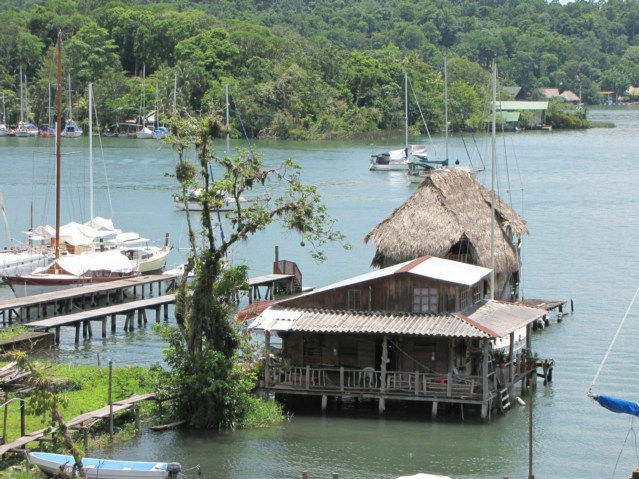 I lived here in Rio Dulce to see if I like the Sailor bunch, let me explain it this way. There are people who love their dog more than people. Well, I think Sailors love their boats more than people, and focus on objects; I always want to find nice people, Sailing is not the same goal. I may one day hitch a ride here and there on a sailboat. However, unless someone gives me a Sailboat for free, which for sure would be easy enough to do, I am not going to be living on Sailboat soon. This is the Sundog Bar, the central hangout for expats or foreigners in this area. 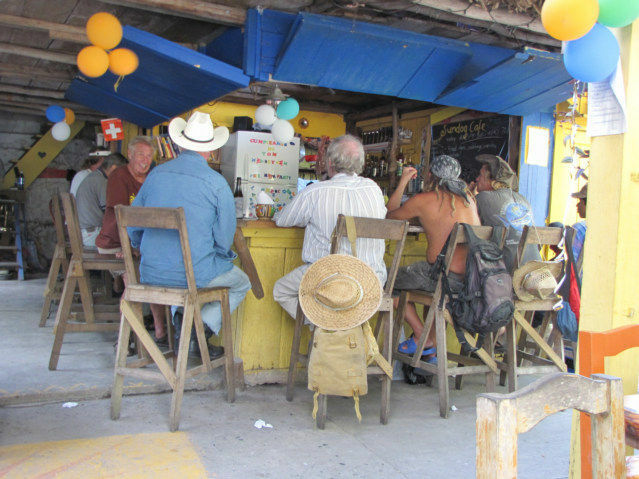 Not many women, mostly this is a bar for crusty old sailor types, a hard drinking bunch. Yet, if you want an answer to a question, this is the best place to ask. 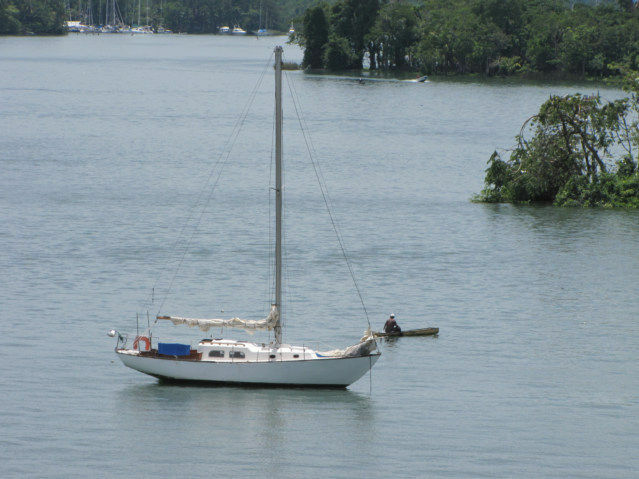 I came to Rio Dulce to explore the lifestyle of sailors, I am leaving less enthused. I think the life is too solitary for me, and for sure, this bunch drinks more beer than they sail. Now, the world is big, I am sure there are many ports, but this hurricane safe port was my best choice in the Caribbean area of the planet. I am positive now I can get a 37-40 foot sailboat for less than 5000 dollars without a problem, when I want one, if I want one, most owners of Sailboat pay continuously for something they seldom use. 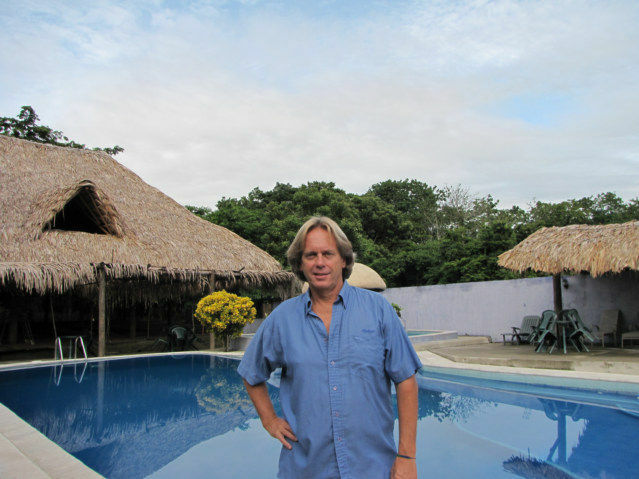 I am off to San Pedro Sula, Honduras tomorrow; I think I will go find another 200 Dollar room in Tela, Honduras for month. This is located right on the ocean, and should be more interesting culturally. The book should bre finished by September 15, 2010. I do not know what the CA-4 rule is, therefore easy to avoid... hehehe I googled it ,but did not understand even the nature of this..
Internet in the room is a quirky benefit, the expensive hotels in the tropics seldom have it adequate, only in the common areas. Small Mom and Pop Hotels have it because they want their children to use the Internet, this does not apply for expensive hotels so they have crap for Internet. When I jump off the "Internet in Hotel" system completely, I can drop down half the price of someone smart enough to have Internet in under-developed countries. I am saying, I am can rent rooms for 3-5 dollars without a problem in Central and South America that are good, but they will not have Internet. 5-10 if they have Internet, just because the owners are more clever about marketing. What sets the price of rooms has little to do with the quality room. The marketing of the room sets the price, and a few fantasies desired by tourist. Truly I said it wrong, I pay double to get rooms with WIFI or 24/7 Internet in my room. The Internet USB Modem will soon become standard, and I will be able to travel anywhere with even cheaper room. Tigo offers a chip here, about 30 dollars per month, this allows 8 gigs of transfer. Well, I am downloading entertainment from torrents so I can go to Africa. I am stocking up to go off the English language grid. Within 3 years, USB Modems will be standard around the world. There is maybe 600 Boats in this Rio Dulce area and may five percent of the boats are used. There are tons of close to abandoned boats. Best way, but a dinghy boat to go up and down this river, contact all the marina here, and walk up to every boat. Get on this website forum and prod around. Then you must allow the owners to save face, and never talk about it to the locals, because many people want to leave their money hole and leave. Chase after hurricane is another, or follow this oil slick. I have found a couple 4000 dollars boats, if I wanted a boat, I would buy a boat. I am not sure I want the lifestyle. I learned what the CA-4 rule is. the shared visa for 4 countries. Visas are the easy part of travel, unless you do not travel, then they are the worry. Flying into Africa and getting visas is a problem, central America is a breeze. "Tourists may travel within any of the CA-4 countries (El Salvador, Guatemala, Honduras and Nicaragua) for a period of up to 90 days, without completing entry and exit formalities at border immigration checkpoints." I did a 90 day extension with El Rancho in Panajachel. There is a man that will extend visa here in Rio Dulce. I could have went to Guatemala and got a 90 day extension at the embassy of Guatemala. I do often stay in one country longer than 90 days, and recommend people not stay longer, life is too short to devout that much time to one country. When a person must work or die from the cold, this could never be Paradise. Between 35 North latitude, and 35 South latitude, is where life is easy. It took me a long time to realize that cold weather induced people to work hard, and then accumulated consumer items. Then somehow they consider themselves fortunate to be working all the time to buy a lot of consumer items. What is truly sad, the people in the colder regions of the world are so stressed, it has become too stressful for me to converse with them, this saddens my Mother I am sure, she knows I am not happy to talk with Americans. I call people in the USA and the mantra is, "I am busy." Truly any person saying that is not in Paradise. I know one thing, I am not busy, I am not even slightly busy. However, I am quite sure I have the skill sets to live in Sweden on 500 dollars per month, but not sure the average Joe could. I on the other hand know the average Joe could live in the 35 latitude ring easy enough.